Films aim to reflect reality, our cinematic stories are populated with death defying stunts, and our blockbuster movies stretch credibility with their exhilarating action sequences. But we know that it’s a representation, and for the most part our film stars aren’t in real danger. 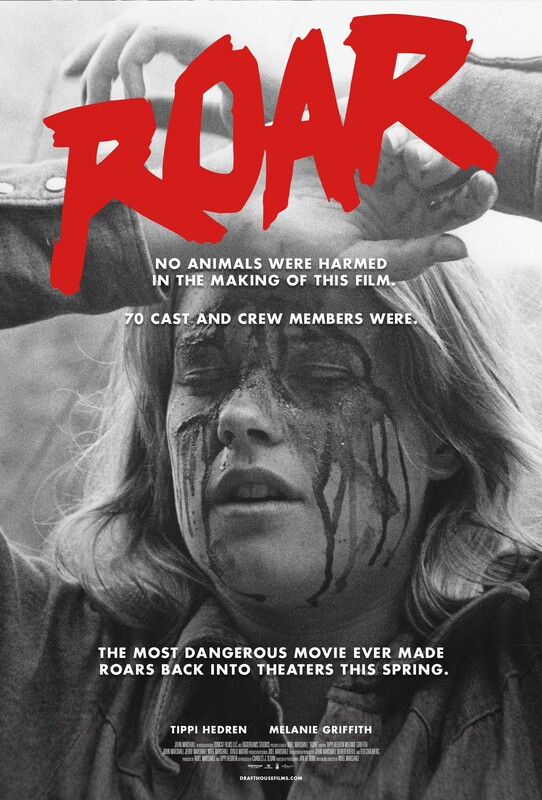 That’s not true of Roar, a film from 1981, recently re-released via Drafthouse Films. Directed by Noel Marshall, a producer on The Exorcist, Roar tells the story of a zoologist (played by Marshall) living and working in Africa. The twist? Marshall’s character loves big cats, and his home is filled to the brim with lions, tigers, and pumas. All of the animals used in the film are real, and Marshall and his family built up a considerable collection of wild animals in the States. Their ranch stood in for the African setting, and the production took ten years, and injured over seventy members of the cast and crew. 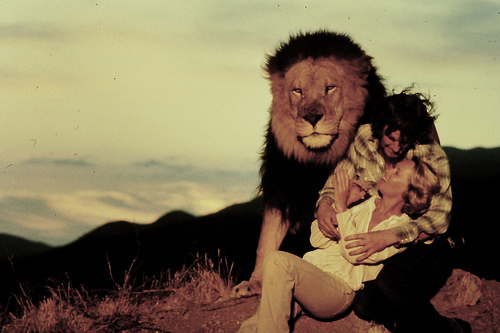 Noel, Tippi, and their lion friend, Robbie. 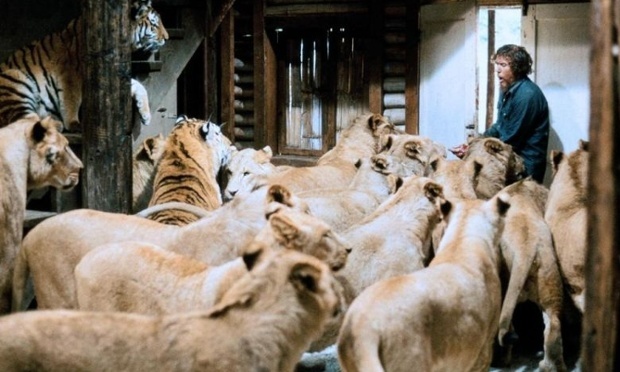 Noel Marshall enlisted the help of his family, his wife Tippi Hedren starred alongside him, and his daughter Melanie Griffith joined them, and their sprawling cast of 150 lions, tigers, cheetahs, and jaguars. It was a dangerous film set to work on. The cats roamed free, and the cast and crew suffered some terrible injuries. Jan de Bont, Roar’s cinematographer was scalped, ending up with 220 stitches; Melanie Griffith required facial reconstructive surgery after a run in with a lion; an assistant director narrowly avoided death when a lion took a swipe at his jugular; and Noel’s wife Hedren fractured her leg, and received multiple scalp wounds from one of the big cats. Noel didn’t escape unscathed either. He was wounded so many times that he contracted gangrene and ended up in hospital. They endured these injuries and attempted to wrest some sort of narrative from the chaos. But wild cats are notoriously difficult to direct, especially when they number in the hundreds, and the production had to adopt a gonzo approach to filmmaking. They filmed with multiple cameras, and they let the cats dictate what happened on screen. This meant they simply left the cameras rolling until they got the shot they wanted – this added to the chaos on set. Then the financiers pulled out. They were two years into the production and Noel found himself penniless with an incomplete movie. So Marshall and Hedren sold everything they owned, this was a project that they wanted to complete more than anything else, and Marshall used the remainder of his money from The Exorcist too. But money and injured cast and crew members weren’t the only things Marshall had to contend with. Two floods, a wildfire, and sick cats plagued the production, and the entire debacle ended up costing $17 million dollars. That was in 1981, the contemporary equivalent would be much higher. There’s a sense of insanity that permeates throughout the film. Marshall himself moved his entire family to California, bought a ranch, and began collecting big cats, in order to start filming. It plays out like a nature documentary, and it’s hard to separate the fact from the fiction. It’s certainly a film that belongs to the ‘70s and ‘80s filmmaking sensibilities. The plot involves Marshall’s character leaving his African set home just before his wife and grown up kids arrive. They then have to contend with the wild cats, in a manner reminiscent of Jaws or any number of horror/slasher films from the New Hollywood era. that’s hard to put into words. In many ways the film is a testament to the dangers of unchecked ambition, of the follies of man, and his relationship with animals. Marshall (and his character in the film) attempted to wrest some kind of narrative and control from the snapping jaws of chaos, and it didn’t work. The film doesn’t function well in terms of style, or even substance. For most of its ninety minute run time, Roar tells a frenzied and out of control story, that sprawls with disorder, until Marshall’s character returns to the ranch, bringing a sense of order. There’s a certain sort of old fashioned subtext about the family unit, the Eden of sorts that Marshall (and his character) thinks he’s fashioned, and the Swiss Family Robinson style finale is as absurd as it is calming. Roar tells a dangerous story. Its tale of animals and humans attempting to coexist peacefully is helmed by Marshall’s real world family and its attempts to befriend hulking roaring wild cats. There’s a Biblical core to the story, perhaps an attempt to let the lion lie with the lamb, but in the process it becomes clear that this parable is not a success story, but a didactic lesson. Marshall bit off more than he could chew. Roar stands as a testament to his folly, but it’s certainly a filmic experience like no other. Marshall’s opus is brazen, the story of the production more interesting than the film itself, and there are few films that have such scope, and such stupidity, inherent in their makeup.